A fantasy bildungsroman, Sea Change follows the isolated, lonely and headstrong protagonist, Lilly, as she explores the limits of friendship. Born into a prosperous house to parents who fight as fiercely as they once loved, Lilly is a disappointment to her father because she is not the male heir for whom he hoped and the birthmark that blemishes half of her face ostracizes her from the townspeople who fear she is a witch. It is not until she meets Octavius, a young kraken who can appreciate the beauty of her intelligence and compassion, that Lilly finds a kindred spirit with whom she can share her innermost self. When Octavius disappears and trouble at home forces Lilly to choose loyalties, she sets off on a quest to free the only true friend she's ever known--but the price may be more than she's willing to pay. With its dark fairy tale quality, female protagonist, and unusual take on gender roles, Sea Change should have been a safe bet for me. And while S.M. 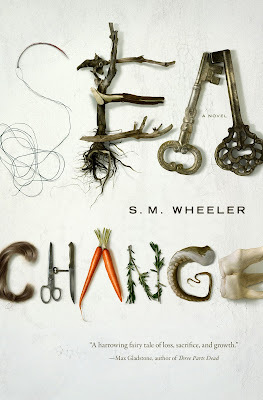 Wheeler certainly creates a fantastic journey for Lilly and does not shy away from the more horrific, gruesome aspects of life, the novel struck me as being somewhat uneven. The transitions that occur in Lilly's life are indeed sea changes, often abrupt and unpredictable events that turn her entire life upside down, but the result was that I often felt as though I was reading a disjointed narrative. Certain events are given too much weight (such as the lengthy interlude with the bandits, during which Lilly's original intent for being there--a bit of clever trickery on her part regarding promised wealth in exchange for her life--is forgotten for several pages), and others are sadly given too little (the kraken appears very seldom in the book and only serves as the motivation for Lilly to undertake a quest that leads to self-discovery). I also found Wheeler's syntax and phrasing to be confusing, often cluttered or inverted for no particular reason or to any desired effect. There are also several instances where references are made to people, objects, or events as though the reader should remember them from a previous mention--which never existed. By the end, I still found myself re-reading sentences and grasping for the meaning. Despite this, I found myself experiencing a sea change in regard to the book once Lilly set off on her quest. Whereas I found the beginning overly long and tedious, Lilly's adventures after leaving home became compelling and I looked forward to seeing what peculiar character Wheeler would introduce us to next: a skinned witch, a troll who exacts an unthinkable price, a pair of homosexual bandits (I particularly enjoyed Wheeler's depictions of sexuality and the domestic, devoted relationship between these two men--even though they were every bit as violent as Neverwhere's Vandemar and Croup), the dark-wife who dines on memory, a zombie tailor whose specialty is the sought after Coat of Illusion, and many others. After a time, though, it seemed that too much was being crammed into one book. Some restraint in the number of characters may have resulted in a more streamlined narrative that was able to showcase these characters in all of their macabre and magical glory. I look forward to reading Wheeler's next novel as there is a lot of promise in Sea Change, but there's also a lot of room to grow.